Don’t tell anyone, but my friend Katie confided in me that she wishes more people would offer feedback on her recipes. It was at that point that I realized I had only made one of her recipes in the past year and a half! Unfortunately, keeping up with recipes for Alisa Cooks, Go Dairy Free, and my next book takes up a lot of my kitchen time. I often forget to make the recipes that I bookmark. I’m guessing that I’m not alone here. But also, I often forget that Katie’s blog, Making Food and Other Stuff, has recipes. (Sorry Katie, but here me out!) Beyond cooking and baking, that girl is wickedly talented … sewing, knitting, crafting … and she has a sarcastic sense of humor that I just love. Even though I definitely get food inspiration from her blog, I rely on it daily for giggles and belly laughs. Sometimes you just need a release, you know? And what many don’t know is that Katie is also gluten-free. I’m not sure if her entire blog from way back when is gluten-free, but for as long as I have known her, not a bit of wheat flour has been sifted into her recipes. Okay, time to get to the point … this month I have “adopted” Katie of Making Food and Other Stuff for the Adopt a Gluten-Free Blogger event, so that I would finally make some of her frickin’ recipes! I wanted something more on the savory side, so I just used just 1/2 Tablespoon of maple syrup and omitted the stevia. 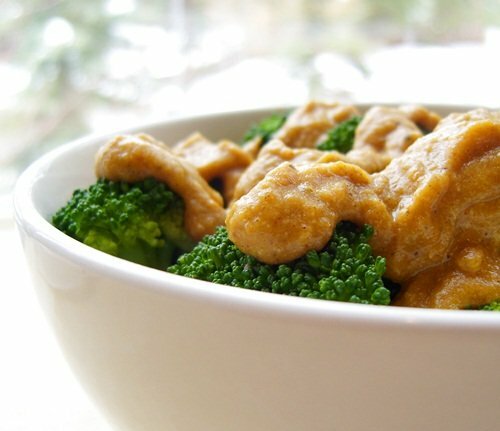 However, I added in 1/2 Tablespoon of creamy unsalted peanut butter and 1/4 cup of water to thin the sauce, which was still quite thick (I liked this, as it clung to my veggies and rice – no runny sauce at the bottom!). Without the water, the flavors were a touch strong for me, but intriguing. The water and peanut butter (Katie, I think SunButter would be awesome too!) mellowed the flavor just enough, but also helped to meld the various components into harmony. It really was amazing … savory, a little sweet, and even a little spicy from the mustard powder. Oh, and she says salt and pepper to taste … I used a generous 1/8 teaspoon of salt and a few twists of freshly ground pepper, and devoured all of the “sauce” in one serving (I dumped the rest on after taking the picture – didn’t want to cover up those pretty greens before shooting!). With the next recipe, Katie taught me something about myself. I was never a fan of chocolate growing up. I mean, it was okay, but I didn’t eat chocolate bars, I could easily pass up chocolate cake, and vanilla ice cream was always the winner. It wasn’t until my mid-twenties that chocolate made its way slowly into my food “likes.” But now I’m realizing that maybe it is the sugar, not the chocolate that I enjoy most. I dislike “bitter” in all forms … tahini, coffee, and low and behold cacao. Yep, those beans are a fairly close cousin taste-wise to coffee beans! So I tried her Vegan Peanut Butter Fudge recipe, which uses unsweetened (bakers) chocolate and has the *option* of adding stevia. Holy moly, that girl loves cacao! I made just a quarter batch, added 1/2 tablespoon of maple syrup, and 20 drops (!) of vanilla stevia and the cacao taste was still too strong for me. It wasn’t so much that I wanted something sweeter, I just wanted something to tame that flavor. I didn’t like the true chocolate taste. Now I’m wondering how much sugar is really in that 70% dark bar? This isn’t to say that I won’t still enjoy some fudge, but now I have to evaluate if my chocolate love is really about the chocolate. You know what I’m saying? Perhaps, just perhaps, a sweets craving can be conquered with this knowledge. Perhaps. I’m not holding my breath here or anything. Regardless, this is a great recipe, and one that you can sweeten (or not) as you please! I used creamy peanut butter in place of the peanut flour and almond milk, since I didn’t have any peanut flour, and the texture came out quite nice. Even with my little addition of maple syrup, it wasn’t too soft. I do love that most of Katie’s recipes are quite low in sugar, if not sugar-free, and that she is a veggie-aholic like me (not that you would know it from all of the dessert recipes I have been posting lately!). I will definitely make more of her recipes in the near future (that woman is a genius with cauliflower! ), that is, once I stop giggling at her posts. Join Me in Chicago, Los Angeles, Atlanta, and Boulder! I am the worst at making other peoples recipes since I’m always working on my own. These look great! It does feel great to know people are making my recipes though…I will have to try out some of Katie’s stuff. What a great adoption post – this pumpkin sauce is super intriguing. 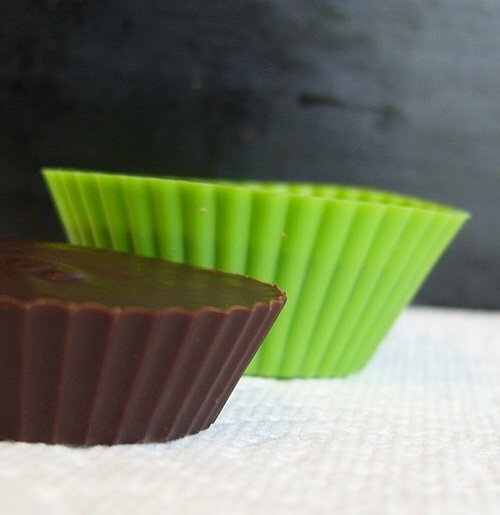 I find 100% unsweetened chocolate to taste too acidic to the palate, whereas when I make it with raw cacao, even unsweetened it is not as acidic. I am not sure why. Speaking of, I am ordering cacao butter this week 🙂 I see lots more chocolate making in my future. Yah! I’m so glad you found some cacao butter Valerie. I think you’re going to love it!! I am blushing like mad over here! I had NO IDEA you were doing this!! I love the changes you made to the pumpkin sauce, and I loved it over broccoli myself. And I need to make it again. I told you I like my chocolate dark. I actually eat the bakers unsweetened bars for dessert sometimes. I love them. Man, I need to make more of these too. Hmmm. I may be ordering some cacao butter and I bet that would be great in place of the coconut butter… incentive to buy, perhaps? Katie is hilarious! I challenge anyone to read her blog and not giggle and lol at least elebenty times. You should try Katie’s beet cookies! I love’em! I hope you enjoy the netflix stuff if you give it a shot. I’ve been on a British Telly kick lately, and I forgot to mention Gavin and Stacey on my list. It’s hilarious! I like the sound of that pumpkin sauce! That fudge is calling me! YUM! I am a cacao girl too. Thanks for introducing me to a great new-to-me blogger! I actually tried to buy some canned pumpkin today because I long ago used up my fresh pumpkin that I had frozen and even a few cans that I had in my pantry. Imagine my surprise when I found out that my store hadn’t had any since before Christmas. The mgr said that the pumpkin shortage continues and they just save the canned pumpkin for distribution during the holidays. 🙁 Too bad … this sauce sounds very good. The fudge does look good, but I believe you that it’s intense. I’m learning to like darker and darker chocolate, but I’m probably not ready for this so maybe I could learn that same lesson you are learning. Oh geez, that area you live in is so weird Shirley! You guys need a big huge natural food store. Yeah, I actually love dark chocolate, but this was still too dark for me – but I know a lot of chocolate purists out there (like Katie) who can’t get enough of that cacao bean! That’s weird. I commented WAY earlier today and it didn’t show up. I wasn’t being all aloof and too cool for school. I swear. It was a good long comment too. Dang. Here’s the gist: I’m embarrassed. I love the changes you made you to the pumpkin sauce. I TOLD you I love bitter chocolate. I might make this again and use tahini….how’s that for unfettered bitterness? Eh? I found both of your comments in spam! Argh, I think you may have been akismeted. Your out of spam for my site anyway now. Wow! That pumpkin sauce sounds amazing! I cannot wait to try that one! Thanks so much for sharing Katie with us, Alisa! And for the record, I am thinking about how much I will love that peanut butter fudge! I love that Dark cocoa flavor!! Yum!!! Her recipes are awesome! I have made quite a few and she has never steered me wrong. Her pumpkin butter is amazing. Hmmm… what else… her cookies, stews, cookies, hummus, cookies, mustards, cookies… you get the idea- all delicious. Oh you are so right! But I’m not about to try any of her crafting projects – I’m all thumbs! You have made a ton of her recipes, I’ll have to cross-reference. I go to Katie for daily giggles and love her sense of humor too!! I also forget to make recipes I bookmark. I don’t have as much going on as you do as far as pressure for new recipes, but I like to try and put up one a week if possible so that usually takes up my recipe time!!! Thanks for sharing hers…I definitely have to try that PB fudge! I definitely need to check out Katie’s blog because it sounds like she and I have very similar tastes! That pumpkin sauce sounds like exactly the kind of thing I would adore! I love Katie so! And by her influence and HEAB’s I totally eat the unsweetened Baker’s chocolate by itself now too… it took me a while of slow weaning, but now I really love it! You are working on another book? I just got really excited! I too do this – I have SO many recipes from bloggers bookmarked that I never get to. Adopt a GF Blogger helps, but still…I’m behind! Like years behind! Love this peanut sauce. So intriguing. And I’m the total opposite when it comes to chocolate! But you can give me all of yours, okay?